Not to be confused with Bailey, Texas. Lower Pauls Lake at Muleshoe National Wildlife Refuge. 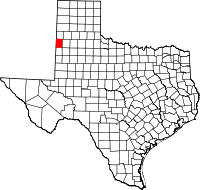 Bailey County was one of 30 prohibition or entirely dry counties in the state of Texas, but is now a wet county. Bailey County history is highlighted in the Muleshoe Heritage Center located off U.S. Highways 70 and 64 in Muleshoe. The Muleshoe National Wildlife Refuge, located in the county, was founded in 1935 and is the oldest such refuge in Texas. According to the U.S. Census Bureau, the county has a total area of 827 square miles (2,140 km2), of which 827 square miles (2,140 km2) are land and 0.7 square miles (1.8 km2) (0.08%) is covered by water. As of the 2010 United States Census, 7,165 people resided in the county. About 75.3% were White, 1.4% Native American, 1.2% Black or African American, 0.4% Asian, 0.1% Pacific Islander, 19.6% of some other race, and 2.0% of two or more races; 59.8% were Hispanics or Latinos (of any race). As of the census of 2000, 6,594 people, 2,348 households, and 1,777 families resided in the county. The population density was eight people per square mile (3/km²). The 2,738 housing units averaged three per square mile (1/km²). The racial makeup of the county was 66.68% White, 1.27% Black or African American, 0.65% Native American, 0.14% Asian, 28.60% from other races, and 2.65% from two or more races; 47.30% of the population were Hispanic or Latino of any race. Of the 2,348 households, 37.1% had children under the age of 18 living with them, 64.9% were married couples living together, 7.5% had a female householder with no husband present, and 24.3% were not families. About 22.3% of all households were made up of individuals and 12.8% had someone living alone who was 65 years of age or older. The average household size was 2.78 and the average family size was 3.28. In the county, the population was distributed as 30.3% under the age of 18, 8.6% from 18 to 24, 24.7% from 25 to 44, 21.2% from 45 to 64, and 15.2% who were 65 years of age or older. The median age was 35 years. For every 100 females, there were 96.0 males. For every 100 females age 18 and over, there were 94.1 males. The median income for a household in the county was $27,901, and for a family was $32,898. Males had a median income of $25,150 versus $18,309 for females. The per capita income for the county was $12,979. About 13.50% of families and 16.70% of the population were below the poverty line, including 20.40% of those under age 18 and 12.60% of those age 65 or over. Most of Bailey County is served by the Muleshoe Independent School District, which extends into neighboring counties. Farwell Independent School District and Sudan Independent School District, which are based in nearby counties, extend into Bailey County and serve small portions of it. ^ "TABC Local Option Elections General Information". Tabc.state.tx.us. Retrieved 2018-07-29. Wikimedia Commons has media related to Bailey County, Texas.